The Anchor Memorial standing in the Dieppe Gardens in the City of Windsor, Ontario sits along the banks of the Detroit River backdropped by the skyline of Detroit City in Michigan, USA. Flags surrounding the Anchor Memorial are raised at full mast where they blow in the breeze which sweeps in off the river. The Anchor Memorial is dedicated to all of the men and women who served in the Royal Canadian Navy and the Canadian Merchant Navy during World War I, World War II and the Korean War. The Dieppe Gardens was also named in memory of the soldiers who lost their lives in the 1942 landing at Dieppe. 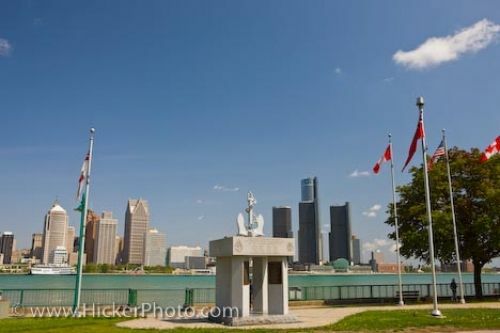 Picture of the Anchor Memorial located in Dieppe Gardens in the City of Windsor, Ontario overlooking the Detroit River. Anchor Memorial in Dieppe Gardens in the city of Windsor, Ontario, Canada backdropped by the Detroit River and skyline of Detroit city in Michigan, USA.